Special Note: Paul Harvey is a legend of the broadcasting industry that I remember all the way back to my young life in the 1960's with great fondness. A real American who gave us the "rest of then story" and an inspiration to me. He will be sorely missed, especially his great love and understanding of the rural American who is the backbone of this nation. God Bless you Paul -Good nite! 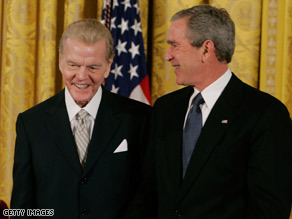 Paul Harvey receives the Medal of Freedom from President George Bush in 2005. Known for his deliberate delivery and pregnant pauses, Harvey's broadcasts were heard on over 1,200 radio stations and 400 Armed Forces networks and his commentaries appeared in 300 newspapers, according to his Web site. He had been hosting his radio shows part-time for much of the past year, after recovering from physical ailments including pneumonia and the death of his wife, Lynne "Angel" Harvey in May 2008. Born in Tulsa, Oklahoma, Harvey began his radio career in 1933 at KVOO-AM there while he was still in high school, his Web site says. He helped clean the station and was eventually was allowed to fill in on air, reading news and commercials. "Paul Harvey was one of the most gifted and beloved broadcasters in our nation's history," ABC Radio Networks President Jim Robinson said in a written statement. "As he delivered the news each day with his own unique style and commentary, his voice became a trusted friend in American households." The statement did not give details about Harvey's death. Jon Meacham and Evan Thomas on Why "We Are All Socialists Now"
"Can America Adopt a More European Model, Only With a Faster Rate of Growth?" In nature religions, February 2 is a cross-quarter or four-quarter day. These days stand at a mid-point between solstices and equinoxes; in the case of Groundhog’s Day, it’s the mid-point between winter solstice and spring equinox. This day was named Imbolc or Imbolog. The word Imbolc may come from a term for “sheep’s milk,” a reference to the first milking of the ewes in the spring. An even earlier Indo-European word that may be related is one that refers to the process of purification. The other three cross-quarter days are: Samhain, Beltane, and Lughnasa. These days are special because divination is easier — the “veil” between this world and the next is thinner than on other days, allowing information and understanding to pass from the other plane to our own. Divination meant observing nature and focused on the most immediate needs of the community — which, in northern regions, involved the weather. Winters were tough and people wanted to know how soon spring would arrive. According to Hebrew tradition, the last stage of the birthing process occurs 40 days after birth, when the mother goes to the Temple to make an offering and be purified. In Jesus’ and Mary’s case, this event is described in Luke 2:22: “And when the days of her purification according to the law of Moses were accomplished, they brought him to Jerusalem, to present him to the Lord...” Forty days after Christmas, the traditional date for Jesus’ birth, was fixed at February 2. The Christian Church appropriated the celebrations of Imbolc just as it did with so many of the other pagan holidays in ancient Europe. Christians renamed this day Candlemas, partially because of the tradition of lighting candles and perhaps also to retain the fire imagery: a common aspect of pagan celebrations was a large fire for the purpose of purification and cleansing. Among Catholics, Candlemas has become a day known as the Feast of Purification of the Blessed Virgin Mary. The Protestant Reformation rejected many of the traditions which were important in Catholicism — in particular feasts and traditions associated with saints. Protestants dismissed the common superstitions involved with lighting candles in order to drive away demons or sanctify anything. Henry VIII personally approved of continuing the festival, but by the mid-18th century, Candlemas celebrations had almost entirely disappeared in all Protestant areas. Watching groundhogs for weather prediction was brought to North America by German farmers who had a tradition of watching for hedgehogs on this date, following the familiar formula of determining that winter would last longer if the day is bright enough for hedgehogs to see their shadow, but winter would end soon if it were cloudy enough for hedgehogs to see no shadow at all. 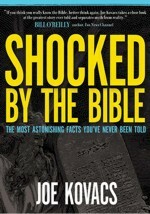 Hedgehogs were hard to find in the New World, but the Germans switched to the similar and far more plentiful groundhog. According to current American tradition, if the groundhog sees his shadow (because of the sunny, clear weather), there will be six more weeks of winter. In the past the seeing of a shadow has been associated with other, similar ideas: the groundhog would hibernate for another four weeks, it would rain for the next seven Sundays, and so forth. There are many traditions and sayings which preserve an association of animal behavior with the weather. These observations may not rise to the level of science, but they shouldn’t be dismissed out of hand, either. Whatever their actual validity, people continue to believe them, so it’s no surprise that Groundhog Day remains popular. Groundhog Day is not, however, merely an attempt to use animals to predict the weather. It also plays an important role in the anticipation of spring and the shedding of winter. Groundhogs (also known as woodchucks) survive harsh winters in harsh areas nearly as fat and sassy as they were when they entered their burrows the previous year. The appearance of the groundhog, regardless of whether his shadow appears too, represents some measure of hope for the coming spring. Commemorating shifts in the seasons, looking back on the past, and anticipation of the future are important functions of our holidays, especially those tied to the rhythms of nature, even when the connection is no longer obvious. In North America, the beginning of Spring is celebrated at the Spring Equinox, not at the beginning of February as it was in Northern Europe. Nevertheless, February 2 marks a shift in the year that we commemorate with thoughts about how long winter will last and how soon warmer weather will reappear. In the past it was a magical time for people, but today the only magic that is overtly acknowledged is in the supposed ability of the groundhog to forecast the weather based upon a few moments of observation. This is all that’s left of the ancient celebrations of the natural cycle. The bill also appears to expand the president's emergency power, much as the executive order signed by President Bush on May 9, 2007, that – as WND reported – gave the president the authority to declare an emergency and take over the direction of all federal, state, local, territorial and tribal governments without even consulting Congress. The history of modern medicene has some burps! Rotten in the State of Denmark: Was Tycho Brahe Murdered by a Contract Killer?